It’s easy to overlook the required step of killing a large furry mammal when what you eat is a cooked substance that’s nearly uniform save for the marbling fat. One reminder of the source comes at the bloody bite of a patty that’s been cooked less than well done. The good news is that we’ve come a very long way since the burger was first conceived (probably a VERY long time ago), when the technology wasn’t available to fabricate something that tastes and feels similar to cooked ground beef. If you’re within reach you can experience what the future might taste like if we’re not able to enjoy beef anymore or just like the idea of eating something potentially more sustainable. I’ve been so excited about Beyond Meat’s Burger product that I created a ChangeDetection alert for location availability. It turns out that being close to the creator is a good thing, although the roll out started in Colorado last year. 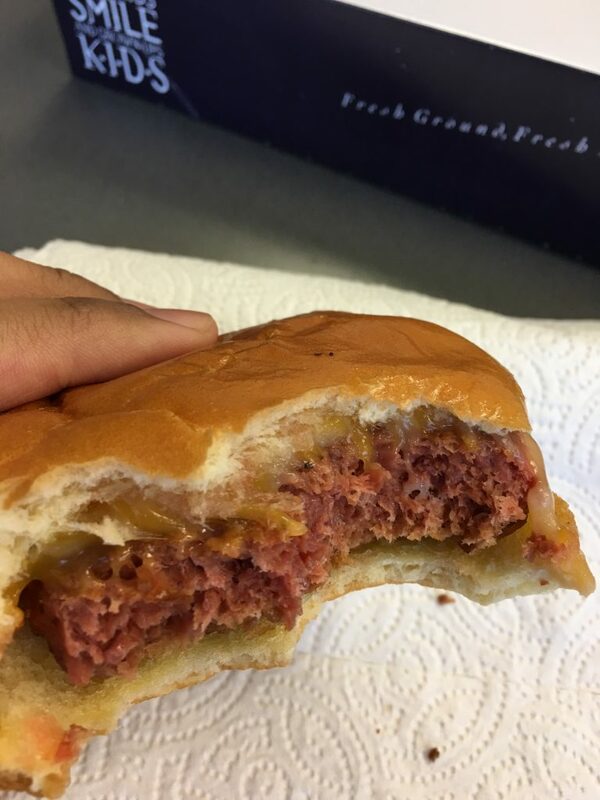 I finally had a chance to buy the Beyond Burger meat and cooked it up at my office. 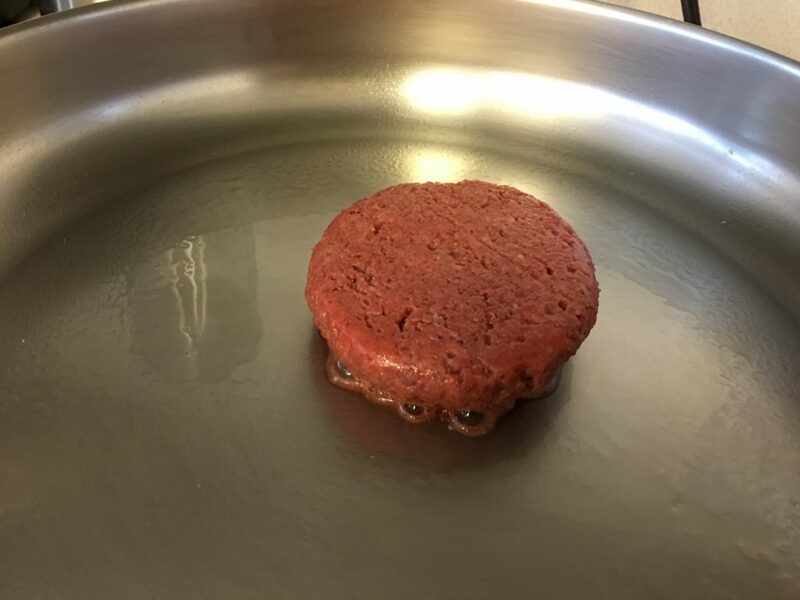 I sprayed a little olive oil on the pan and threw the patty on after letting it warm up. The first sign I knew the pan was hot enough was the sound of sizzling. Lots of things sizzle once you throw them in a pan, but there was something special about the bubbling that happened with the Beyond Burger. The aroma that came out of it smelled meaty, like blood. The juice is actually from beets. If you were to walk by while the patty was cooking, I bet you would think I was cooking a regular patty of beef. 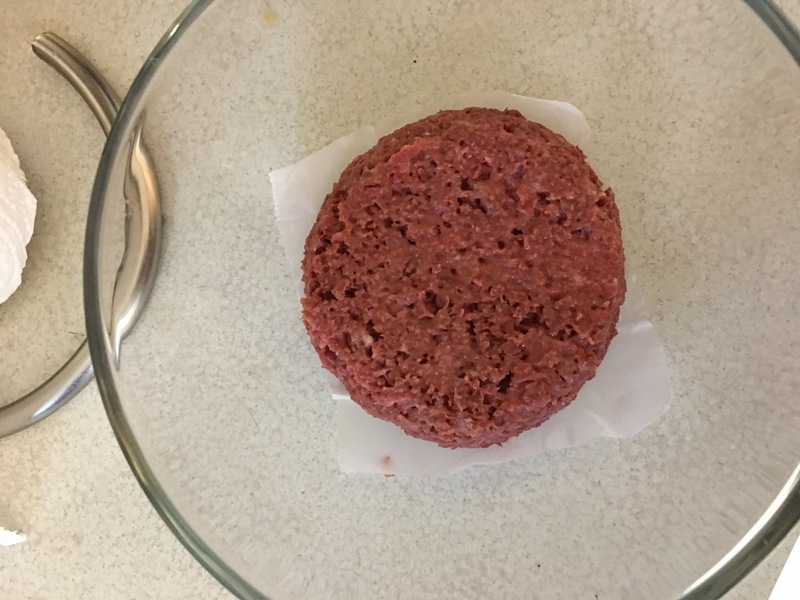 After a flip, the line of distinction between Beyond Burger and meat became more clear. Rather than turning dark brown/black, the patty was just turning darker red. This probably shouldn’t be alarming. The product was never raw to begin with so don’t expect it to act like beef 100%. The taste? I like it. It’s great and I want more of it. The bite reminded me of the experience of having a real burger. It wasn’t as juicy and obviously not as greasy but still quite most, something not necessarily experienced with white meats like turkey or chicken. To put things in perspective, I’m pretty open to eating most meats. I grew up on and still love In-N-Out. It’s still may favorite burger whenever I go to my parents’ place and get too lazy to request a grilled cheese burger when they take orders. Unfortunately, I can’t make any bold claims about the nutritional value of this product compared to others. The stats look good, but I’m mainly presenting a few thoughts on my experience since I wanted to know how it tasted and what it was like to cook. I had it for lunch and went on my day without any noticeable feeling of fatigue or upset stomach. Since Whole Foods sells them, expect to pay a premium for this bleeding edge product. No matter how much you fall in love, are you able to afford a burger who’s patty costs $3 often? That actually isn’t very much considering the price of a decent burger at your local fast food joint. You can easily rack up a bill a places like Carl’s Jr that reminds you fast food is certainly convenient but far from cheap. It’s just that regular ground beef is WAY cheaper. Or maybe it’s cheaper than beef if you’re fancy and getting nice cuts ground up by the butcher. I’d be remiss to exclude the fact I spent more ($7.50) on pack of beautiful brioche buns than the actual meat that fills it, although I get 6 buns and only 2 patties. Another great variety of vegetarian patties comes from Morning Star. They’ve been around forever and I do enjoy the taste although there’s something nice about being able to cook the “patty” to your liking just before it hits the bun, rather than nuking it in a microwave. Simply, the Beyond Meat is a far closer match to the experience I enjoy of consuming a burger. But this brings us to a good question: who is this for? Do folks who abstain from animal meats want a burger that struts around looking like beef? There are plenty of products out there that don’t bother with the facade and just look like a mosaic of vegetables (e.g. garden burger). 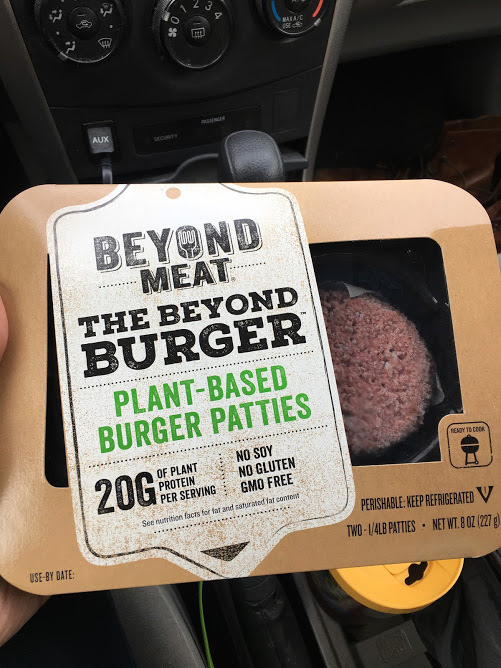 It will be interesting to see the commodification of alternative meat products like Beyond Burger. It’s mainly available at Whole Foods, a store many people don’t have access to or will never shop at due to considerably higher prices, but be patient for similar products to trickle down to stores like Trader Joe’s, Vons, or even Walmart. As far as the company’s viability, consider Tyson, a major player in this industry, invested money into Beyond Meat and even brilliant, billionaire/philanthropist Bill Gates sees the potential in this product. This is just a sign of the times as people are waking up to the fact that today’s options are far more advanced and satisfying than those of yesterday.